When creating a workflow, there are sometimes more than one possible action you'd like to take once you've found a file. A handy way of dealing with these alternative actions is by using modifier keys. The workflow below has a secondary action (between the green File Filter and the lower yellow action, Reveal File in Finder), which is triggered when pressing the ⌥ (Alt) key when the result is shown in Alfred. To add an alternative action, double-click the round marker along the connecting line after an input object to show the menu below. Choose your hotkey and add the modifier subtext to jog your memory when you press the modifier. In Alfred 3, you can lay out and connect objects in any way you want. As such, we've added a Window Behaviour checkbox, allowing you to tell Alfred not to close the window between inputs. This prevents the Alfred window from flickering. For an example of this, take a look at the Getting Started guides and examples in Alfred, which you can find under the [+] button at the bottom of the Workflows sidebar in Alfred's preferences. 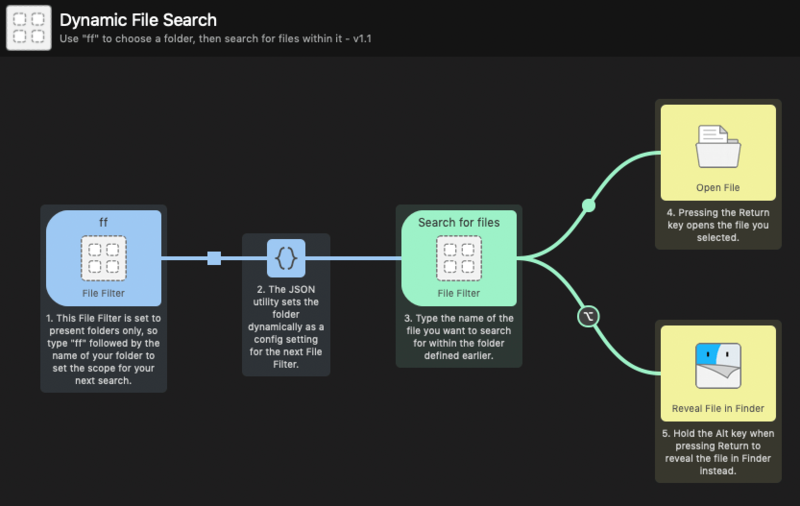 The Dynamic File Search and Simple To-Do List workflows both use this option; You can see that the connection between the first two objects has a square marker, which indicates the window behaviour has been set to "Don't close". In circumstances where this box isn't checked, you'll see a round marker instead. In the To-Do list example, this ensures that there is no window flicker between you typing your task and the second input where you select the list to which your task will be added.